Play Well, Look Better: Over 75 Active Brands with Style. *All sizes on the website are in US. Chest/Bust: Measure at the fullest part of the chest, under the armpits and over the shoulder blades, keeping the tape measure firm and level. 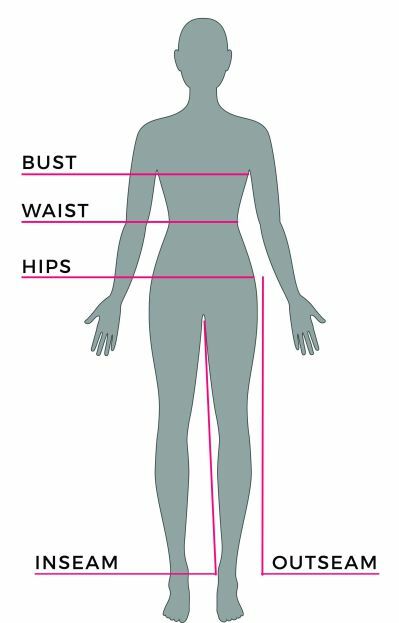 Waist: Measure around the natural waistline, allowing the tape measure to sit comfortably. Hips: Measure around the fullest part of your hips. Outseam: Measure from the top of the leg at the outside hip to the bottom of the ankle. Allow 1-2 days for order processing. Note: International shipping costs do not include duties or taxes. No returns or exchanges on final sale items. © Pinks and Greens All Rights Reserved.